Access our Download Center where are available the documents with all the information about our products. With more than 40 years of aquarium manufacturing experience and extensive knowledge of aquariums, José Pereira created Aquatlantis together with his three children, focusing on a more dynamic concept and equipping the company with advanced technology machines and specialized human resources. To this day, Aquatlantis has remained true to its principles, which have enshrined the motto of "Quality, Design and Innovation" and made it a leading company in aquariums production. 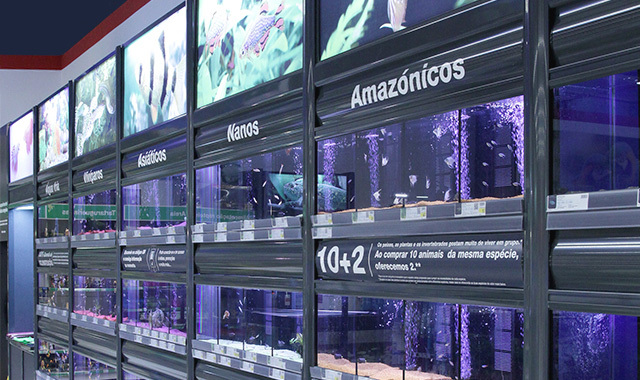 Already with more than 25 years of experience in Shopfittings, Aquatlantis began in 2001 the manufacture, installation and assembly of displays for pet shops, fully customized. At this time, the company achieved double-digit growth in the average annual rate. The company has moved to a larger, more modern building with twice the area, which has all the favorable conditions for organization and autonomy, fundamental factors that a company of this magnitude can not minimize. Terratlantis is created, the sector dedicated to the manufacture of terrariums for reptiles and amphibians and aquariums for turtles. Like aquariums, only high quality materials are used. Made of aluminium, they include front doors and top grids with air circulation system. Highly comfortable for the animals and with easy access to the interior. The company's certification process was concluded, under the ISO 9001: 2000 norm, applying to the scope of "Design, development, production and after-sales assistance of aquariums, vivariums, terrariums, luminaires, furniture and displays pet shops". This year, Aquatlantis acquired two new machines for the Carpentry sector. Extremely fast, powerful and precise, the Rover C represent the top of the line, surpassing expectations in terms of furniture, plastics and non-ferrous industrial materials. They have the fastest machining in their category, capable of high performance, even in the most demanding environments. Perform 8 simultaneous operations on the same piece. In 2009, the company had already acquired a new injection machine "Series D". In 2010, it obtained a new machine of the same range, a more technologically advanced model. They are machines of compact construction, with high performance. Its cylindrical construction allows excellent movement, ensuring perfect alignment of the mold elements. The company's Quality System certification is applied to a new scope: "Design, development, production, marketing and after-sales assistance of aquariums, vivariums, terrariums, furniture, lighting, filtration systems and displays for pet shops", already covering the ShopFittings sector. To this date, the company's certification has always been maintained, with constant renewal of the areas applied. Today, Aquatlantis exports about 98% of its production to more than 30 countries worldwide, becoming a leading company in aquarium and accessories manufacture. The brand is then enshrined in numerous international markets, such as the competitive and sophisticated French market, or the demanding German market. At the end of 2016, the construction of a new pavilion with 4 thousand square meters was begun, to reorganize the various sections, assembly lines, storage and stock creation, consequently increasing the production capacity. The pavilion was concluded in early 2017.